Prices of clothing on this catalogue will be valid until one day before Easter Sunday. Sleepwear for kids are featured. The products on pg 20-21 are pretty good deals. 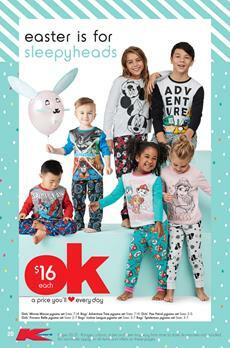 Pyjama sets, baby apparels, and awesome prices by Kmart are viewable. You can find ladies and mens sleepwear. Get comfortable products for better sleeping quality. Check out current price range for PJs. Casual clothing for everyone can also be found on Kmart Catalogue. Cross Over Hoodie, Garment Dyed Joggers and more products are all available. Get a nice hooded parka for only $40 at Kmart stores. This catalogue also has outdoor camping products, bikes, kids entertainment, kitchen appliances, travel supplies, pet products and more. Tees on pg 21 for kids are only $9 each. Find baby licensed Minnie mouse romper, and Mickey crew sweat. Baby Girls' and Boys' novelty romper or furry romper can be purchased for only $15 each. Novelty fleece onesie for girls are priced at $16-$18. Check out knit sleepwear on pg 23. Knit flannelette pyjama set prices are $13, $11, $15 on pg 23. Ladies sleepwear are available on pg 24.